World’s Finest Comics #189 sported an eye-catching cover. Superman, obviously a corpse, is about to donate his heart to Batman. Okay. Here’s hoping they’re the same blood type (though this being the 1970s, the idea of typing organs may not have been in practice). In all honesty, these sort of stories are a personal favorite. They are just so zany and unpredictable (except for the fact that Superman can’t really be dead, and that the story must be a bizarre dream/what if/strange sting operation) and are what comics are meant to be, true escapist entertainment. Sure, you have to completely suspend any semblance of logic while reading the story, but hey, it’s a comic book! Who takes a comic book seriously anyway? Well, besides the creators and publishers, there was one other group that took comics very seriously back in the early 1970s. One glaring difference from then and now is censorship – books in the present era have virtually no censorship qualms, especially after adopting the methodology used in rating motion pictures. Got an adult themed story – rate it R and leave it to the parents and store owners to enforce. 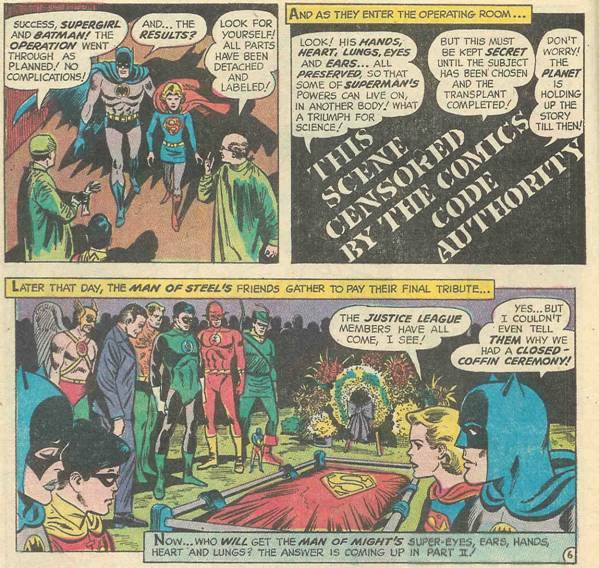 Back in the 1970s, every book had to have the Comics Code Authority (CCA) seal of approval or fear public reprisal, or so the theory went. Companies were wary of the near closing of the entire industry in the 1950s thanks to Juvenile Delinquency witch-hunts, and the CCA was their peace offering. Since the industry made it to the 1970s, it must have worked. But how well? So back to World’s Finest #189, a relatively harmless story, bizarre as it may be. Superman drops to Earth, dead. 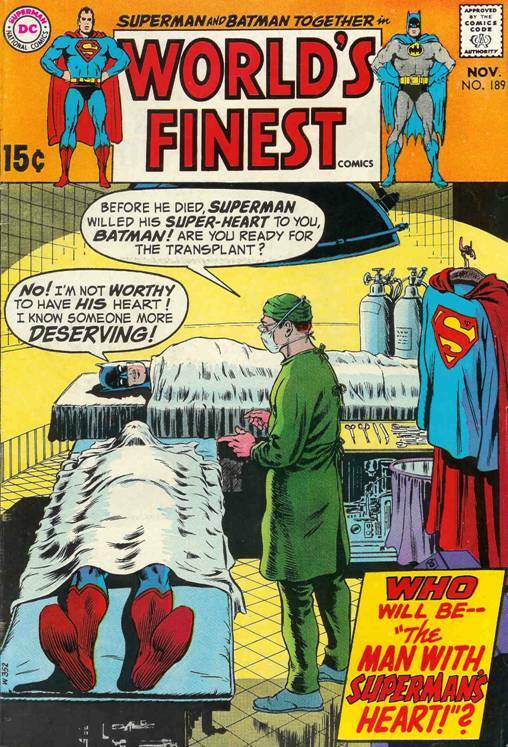 In his Will he wishes his organs to be taken and transplanted to the most worthy citizen on Earth (organ donor cards for superheroes not being invented yet – man, there’s an untapped goldmine in stories right there!). The city leaders, obviously the most qualified to choose the WORLD’S most deserving citizen (as I said – logic can’t be applied here) choose Batman, and the doctors go to work harvesting Superman’s organs using specially designed Kryptonite tools originally developed by the Man of Steel and delivered by Supergirl. Oh, I get it! The lights went out in the hospital momentarily and some silly graffiti artist spray painted some weird, glow in the dark letters! It’s so obvious! 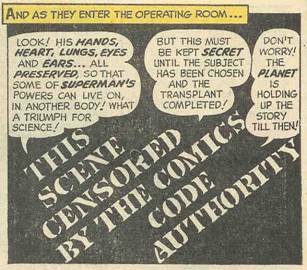 Obviously the display of properly harvested organs from the Man of Steel was deemed too graphic an image for a CCA book, and rather than just blot out the organs themselves (a common practice was to alter the offending panels to allow passage by CCA), the whole panel was blacked out. Perhaps it was too close to the publishing date for a more subtle change to be made, but boy, it’s weird spotting such a panel in a book. This single inclusion kind of throws the whole story out of whack, which is a major accomplishment considering the nature of the story. You know, even 30 years ago, who gets freaked out by hand drawn disembodied body parts? Sigh, when did the fun go missing from the funny books? Superman, Batman, World’s Finest Comics and all related characters and stories are TM and © DC Comics.